This entry was posted on December 15, 2015 by Jessica Anderson. Stunning, impressive, durable and consistent. That's what sets this award apart from all the others. Our Waterford Award sparkles with beveled edges. 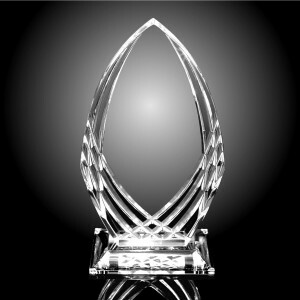 The Waterford Cut Acrylic Award by RB Fabrication wins the Trophies2Go 2015 Product of the Year. Nominated by our Production Manager Tom, he chose this award because of the high quality and elegant design. Our engraver Lori likes how this award is consistent from piece to piece and is easy to engrave. It always looks great for our customers. This stunning award features sparking bevels in the Waterford style with an an elegant pointed oval shape on a sturdy acrylic base. Made of clear acrylic, it has the drama of a crystal award with the durability of Lucite. "We used this product for our Employee of the Year awards and it really made an impact. Award is large, attractive, and really makes a statement." "This Award is quality. It truly looks like Waterford Cut Crystal. The work on the personalization is great too." Thank you to our vendor RB Fabrications, who supplies us with many of our top selling, highest quality acrylic awards. Based in California, all of their awards are made in the USA. We are proud to carry RB's awards in our online catalog and especially proud to feature one as our 2015 Product of the Year! For past Product of the Year winners, check out our 2012 Monster Trophies, 2013 Honey Badger Trophy and 2014 the Swirl Egg Art Glass award!